The first thing you need to do is think about what you will need your money for in the future. Consider the costs of things such as marriage, children, buying a home, paying for college, starting a business, healthcare, travel, and retirement. Some of these things are expenses that you’ll probably need to save for over a long period of time so starting early is helpful. Think about where you will be at different stages of life, and figure out what you will need your money for at those milestones. This part of the process requires you to think long and hard about how you see your life unfolding over the coming decades. The hopes and dreams you have for yourself and your family will have an impact on how much money you need to accumulate. For example, money you’ll need for a retirement traveling the world is different from what you would need if you decided to move to South America and spend your days swinging lazily from a hammock. Perhaps you will want to work part time in the early years of your retirement, which will not only keep you active but can help stretch your fixed income. Or another example would be if you plan to pay for all your child’s college education. You’ll need to plan differently than if you tell your child that you will pay for tuition at the local state school, and he or she will have to make up the difference if a distant school is chosen. If you know that you’ll be getting married in the next two years, you’ll invest differently than you would for a retirement that is 30 years away. You can use online calculators to help you figure out how much money to set aside to reach certain goals within certain timeframes. If you decide that you can retire comfortably on $800,000, and you plan to retire in 25 years, an online calculator can help you see that you will need to set aside $1,000 a month, assuming a 7% annual return on your money. You can use the Rule of 72 to help you estimate what you need to save for other milestones. The Rule of 72 is a formula that lets you approximate how your investments will grow in a retirement or other investment account. 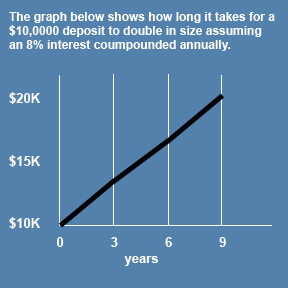 Basically, the rule calculates how long it takes to double your money at any given rate of return. For example, if you contribute a deposit into an investment account, and you anticipate a rate of return of 8%, simply divide 72 by the rate of return and you will have the number of years it will take to double your money. This rule assumes that interest is compounded annually. You can also use the rule of 72 to also determine the rate of return needed to double your money over a specific period of time. For example, if you have $10,000 that you want to double for college tuition in 10 years, dividing 72 by 10 will give you the rate of return you’ll need annually compounded to reach that $20,000 goal. As you set investment goals, it’s important to consider your risk tolerance. You will need to choose investments that are likely to help you reach your goal, while at the same time not putting your finances too much at risk. Diversifying your investments can help you get a mix of growth investments and less risky investments that can provide a safety net if you experience a set back. Note that some investments are ideal for short-term goals, and others work better for long-term investing. As you set your investment goals, you need to plan to adjust your portfolio. As we’ve seen over the last decade the market doesn’t always perform as we expect it so some of your assumptions about investment growth may not materialize. If your money isn’t growing as fast as you’ve planned but you still have the same goals with the same costs then you’ll have to increase the amount you’re puttting away to stay on track. The market could make up for poor performance in years down the road but it’s not a sure bet -you know increasing the amount you save will make a difference. You also have to be ready to adjust your asset allocation as you move through life and get closer to some of your goals. The closer you are to needing the money, the less risk you want to expose it to. Keep track of where you are on your goal timeline, and be prepared to shift from growth investments to investments more likely to protect your capital. Setting your goals is an important step, it lets you know what you’re aiming for. However, if you’ve ever made a New Year’s resolution you’re probably aware that achieving a goal can be a lot more difficult that creating it. Once you have set your goals established, you’ll want to a plan in place to reach them. You’ll know how much money you want to invest each month and chances are you don’t just have that much sitting around in your bank account. So the first step to reaching your investing goals is to figure out where that money will come from each month. You can find the money by cutting expenses, earning more income, or a combination of the two. Consider what items you can cut from your budget to help you meet your investing goals, it might be easier to make the cuts since you know you’ll be getting something in return down the road for each cut you make now. Once you know how much spending you can eliminate each month, if you’re still short of your investment goal you can look for ways to earn extra income. You may find your level of motivation to earn more money might be boosted by your investing bucket list. Once you have your investing plan in place and know how you’ll make it happen, it’ll be up to discipline and consistency to accomplish your investing goals. Great advice. You can’t start to early on thinking about financial goals, especially since most of us don’t have pensions anymore and Social Security is a bit shaky.